The Indians’ J.J. Killen takes a homerun swing in the second inning. 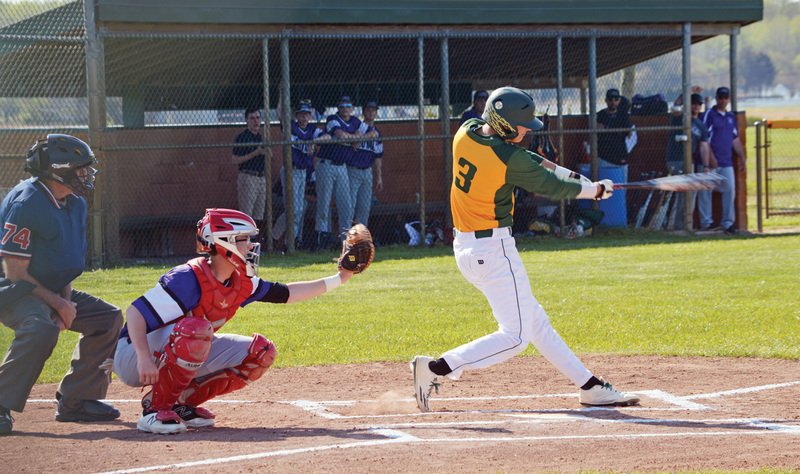 Early on Tuesday, May 1, it looked as though the Indian River High School baseball team was going to right the ship of what had been plaguing them the past two games. However, an inability to eliminate mistakes, walks and a lack of execution at the plate led the Indians to their third straight loss. This time, it was a non-conference setback to Delmarva Christian, 8-6. “It’s the same thing over and over again, and it’s the mistakes that are starting to pile up,” Indians manager Derek “D.J.” Long said after the game. “We have a double-play ball there in that last inning that hits third base, and then a dropped fly ball that gets us into trouble. Delmarva Christian, he said, “got hits early in the game, but they weren’t hitting later in the game. At-bats-wise, we have first and second, with nobody out there in the sixth, don’t get the bunt down, end up strikeout. Next guy hits a shot to right, unlucky right to him. Despite falling behind 1-0 after one inning, the Indians recovered with a four-spot in the bottom of the second inning. Junior J.J. Killen led off the home half of the second with a home run to deep right-centerfield. Cole Hitch and Grant Argo followed with singles, then Kyle Firle added a single of his own to plate Ian Shaner, who was running for Hitch. After Brock Wingate lined out to center, Tyler Kramer laced a ball to center that was dropped by the Royals’ defender, which loaded the bases. A RBI fielder’s choice ground-out by Jacob Anderson made it 3-1 Indians as Argo crossed the plate, and the fourth run scored in the form of Firle on a wild pitch. The Royals would get one back in the top of the third, to make it 4-2, and it would stay that way until the bottom of the fourth, when IR struck again. A beautifully placed bunt by leadoff hitter Tyler Kramer got things started, but he was retired on a double play by Jacob Anderson. However, Derek Bellemare would get things going again with a walk, and then Mark Smith roped a double to right to score Bellemare. Killen again came up big with his second extra-base hit of the game, this time a double to center that scored Smith, making it 6-2. But the fifth inning would see Delmarva take advantage of the walks and errors to which Long alluded. A pair of walks and two Indian miscues led to four Royals runs that tied the game at 6-6. More walks and three more errors in the top of the seventh would allow Delmarva to score their go-ahead and winning runs, to make the score 8-6. “I don’t think that we have been playing with enough emotion and energy,” Long assessed of his squad. “I feel like we are kind of just going through the motions, honestly. Luckily, this wasn’t a conference game. Extra bases: Delmarva’s Wes Hobbs and Joseph Jones each had three hits for the Royals, with Hobbs coming up a home run shy of the cycle. For the Indians, Killen, Argo and Firle each had multiple-hit days, with Killen driving in a pair of runs. Six different IR players scored runs in the game. Chase Hall took the mound loss, while the Royals’ Riley Culver picked up the win.